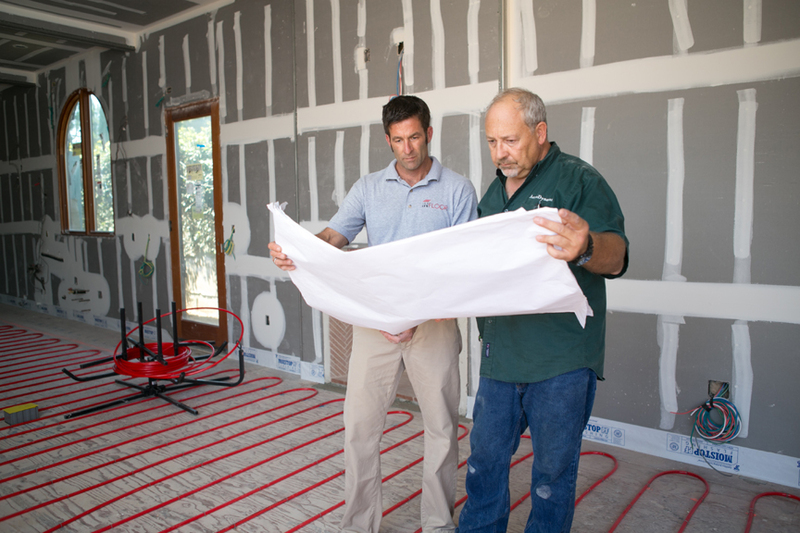 Homeowners and business owners have options when it comes to installing Infloor Heating Systems. Experienced contractors can take care of the entire process, working with us directly to ensure the system is optimally installed and operational. However, some ambitions homeowners enjoy taking on the challenge themselves, for which we also provide support and guidance. 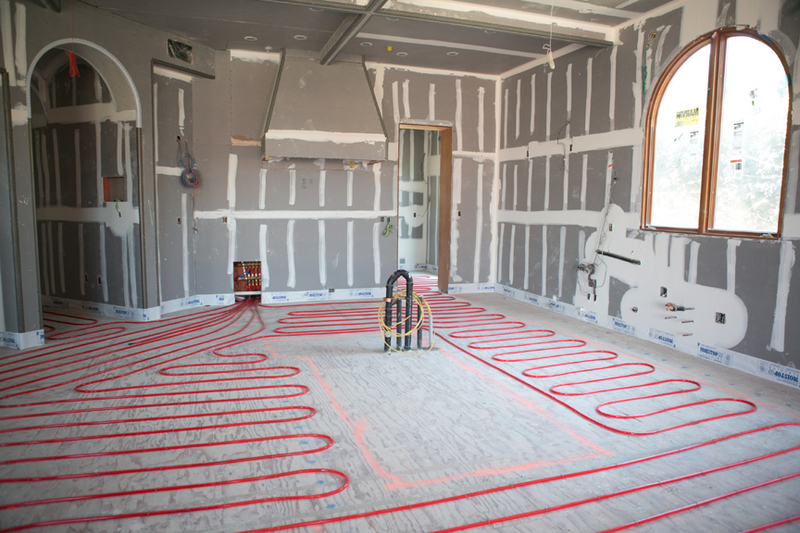 Whether you are a DIY-er or experienced contractor, when it comes to installing a radiant heating system, there are important rules to the installation process, considered the “golden rules,” to live by for the best results and outcome. The first step to anything is having a solid plan. Infloor Heating Systems offers free, custom installation plans for every project, complete with a detailed materials list. Simply provide us with a floor plan, details on where permanent fixtures and air vents are located, and note the thermostat locations. 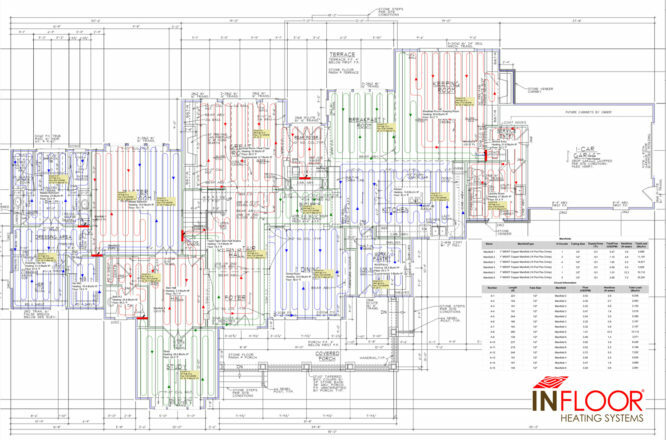 Infloor Heating Systems will provide a detailed design with color-coded loop layouts, manifold locations, heat calculations, and more. A custom installation plan may be requested online at www.infloor.com/project-planning or by phone at (719) 395-3400. Along with your installation manual, this is the most important document you’ll need to step you through the installation process. 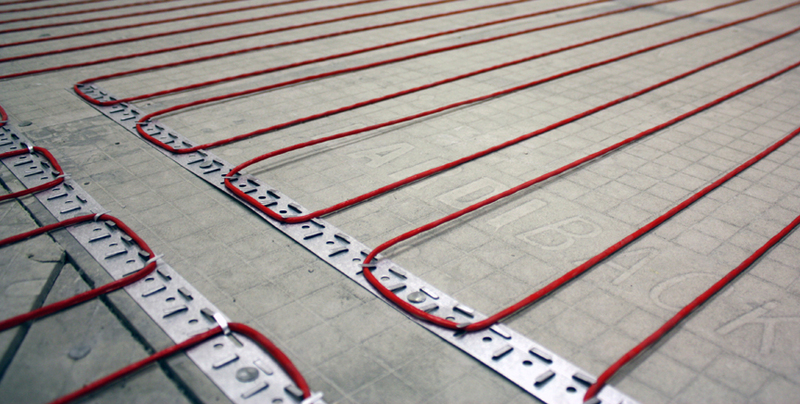 Infloor radiant heating systems are not designed to go under permanent fixtures or over air vents. It is important to avoid these areas to ensure that your Infloor heating system doesn’t overheat. Permanent fixtures include things like cabinets, toilets, showers, tubs, etc. Floating vanities, however, offer enough space between the floor and the vanity to make it safe. In general, there should be enough “room to breathe” between your Infloor heating system and any fixtures above. If there’s any concern that your project doesn’t follow this rule, you can double check by contacting us at (719) 395-3400. It is important to design radiant heating systems around permanent fixtures, never under. Infloor electric cable systems are a great choice for single rooms, remodels, and small outdoor spaces. The electric cable comes pre-sized for each room and is installed in a continuous pattern. It is very important to never cut or nick the heating wire or elements. Throughout the installation process, it’s vital to ensure that the heating cable stays intact — both for the safety of the installer and the success of the project. Never cut or nick an electric cable. If you are installing an Infloor electric cable system, it should be monitored throughout the process with a digital ohmmeter. This tool ensures that the system is in good working order and stays within the allowable ohms resistance range specified on the product. Similarly, attaching a Circuit Check to the system throughout the installation will alert you if any damage is done to the heating element. For instance, if the wire gets nicked, cut or even bent too tightly, a siren will go off on the Circuit Check, alerting you to stop your work and make sure no damage has been done. Infloor Heating Systems offers free technical support. If you ever have a question before, during, or after installation, don’t hesitate to contact your Infloor representative, or call us directly at (719) 395-3400. Our decades of experience can help you troubleshoot any design or installation challenge. It’s our mission to help our customers have the knowledge they need to make the best decisions for the best experience with our heating systems. Contact us to learn more about how we make radiant heating simple. We provide individual project support from beginning to end. Based in Buena Vista, CO, Infloor Heating Systems® is a pioneer in the radiant heating industry, designing and providing premium systems since 1984. Infloor is dedicated to offering the best radiant heating systems on the planet, specializing in hydronic and electric radiant heating, with additional energy-saving solutions such as solar and geothermal options. Infloor Heating Systems is bringing a new age of heating, energy-savings, comfort, and healthy living to people throughout the United States.